We recently had the opportunity to speak with Lisa Shpritz, Senior Vice President at Bank of America. Lisa is smart, funny, and dedicated to the environment (and good business practices). In addition to her “real” job, Lisa also serves on the Board of Directors of the USGBC in the Finance, Surety and Corporate Real Estate seat. What is your current role at Bank of America? My official title is Environmental Risk and Sustainability Executive and I am part of Bank of America’s Corporate Workplace Group. My role is twofold: running an environmental risk group that manages environmental compliance and a sustainability team that focuses on integrating environmental practices and principles into the way Bank of America does business. I have been with Bank of America for five years, coming here after graduating from UNC’s Kenan-Flagler School of Business. Prior to attending UNC, I worked in international environmental management for a telecommunications company. This is the first time I have worked at a large company, and it is great. My background is in environmental management (I have a master’s degree in environmental management from Duke and a BA in Biology from Cornell), and I have always been interested in contamination and its effects on real estate (brownfields, for example). In business school, I made the connection between environmental management and business, and really focused on real estate. At Bank of America, I get to pull all of my interests together, working on a really broad range of everything – cleaning brownfield properties, maintaining compliance, arranging air permits, dealing with hazardous waste and asbestos, and everything from carpooling and water conservation to LEED certification, recycling, and waste management strategies. We have over 125 million square feet of space (approximately 10-11,000 buildings), and have lots of opportunities to improve the environment. What green/sustainability-related project are you most proud of? I think my greatest accomplishment at Bank of America is putting together our team. I never imagined that five years later the group would be what it is today. The team has recently expanded (we added six people in the last six months). The team is comprised of two environmental risk managers who are responsible for maintaining compliance for all of Bank of America’s domestic properties, an associate engagement manager, and a sustainability director plus her team, which includes a person dedicated to LEED-EB, a person dedicated to waste and water, one who is responsible for green leasing and transactions, a sustainable transportation manager, and a person dedicated to supply chain sustainability. The associate dedicated to green leasing and transactions has a very challenging task. Many of our facilities are leased, and this person is responsible for making sure that the language in our leases is green. They are also responsible for working together with our landlords to integrate services like recycling and green cleaning – things you think would be easy, but when maintaining consistency over such a large portfolio, become very challenging. Our sustainable transportation associate is responsible for running our Hybrid Vehicle Reimbursement Program (we reimburse associates $3,000 for the purchase of a new hybrid, electric, or compressed natural gas vehicle), setting up electric vehicle charging stations, and managing our compliance with trip reduction ordinances across the country, among other things. The associate engagement position was developed to help Bank of America get the story out to our associates. We have lots of great programs available, but until now, did not have a good way of getting the information out. Our program is based on a foundation of compliance, which I think is very, very important. Any sustainability program worth its salt is steeped in compliance. Many organizations are so rushed to get a program up and running that they forget to look at the basics. I’m very proud that Bank of America has developed a solid, holistic, environmental program that is now integrated into the way we do business. It’s not extra, or other, or fringe; for example, LEED certification is now our standard for how we build our banking centers and renovate space. What has inhibited you or Bank of America from making more progress on the sustainability front? This is a hard question. From the very start, I had incredible leadership support from Bank of America’s senior management. At the very beginning it was a little tough because I think people were maybe a little suspect, but overall the reception has been incredible. I think it helps tremendously that we have constructed our environmental management and sustainability programs so that they make sense financially – they are not an “add on,” but instead an integral part of the way we do business. What advice would you give others in your position trying to make a difference for the environment? If you are starting a sustainable program from the very beginning, the best thing to do is to pick a couple of “low hanging fruit” projects that will absolutely save money. Once you have documented the return on investment from these projects, use them to prove to leadership that there is a business case for going green. A perfect example of an easy win is changing out light bulbs. This is easy to implement and easy to show a return, no matter where your company falls on the green spectrum (white or deep green). Another easy win is being wiser about waste. Investing in a cardboard recycling program can lead to instant returns. Most commercial offices have waste streams that are very heavily comprised of cardboard. By recycling cardboard, waste removal fees will be lower, and, depending upon your municipality, you may be reimbursed for recycling the cardboard. Generally speaking, when you are getting started, look at practices that are common sense, things that are “quick hits” that save money easily. 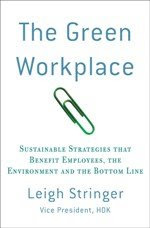 Once you have established a market for environmental behaviors, it is easier to get approval. What types of strategies have you found most challenging to adopt/push through? Changes we make in our portfolio have to make financial sense. We don’t make choices to do things just because it’s the right thing to do (although that’s certainly part of the decision-making process). Our national energy team is fast and firm that we do projects that make sense for our shareholders, clients, and associates. Because of this, we’ve found a lot of support. It may sometimes limit the projects we do (for example, those with a 25-year payback are hard to sell), but has enabled us to maintain an incredible level of support for environmental programs. When times get tough, our integrated approach has helped tremendously – sustainability is more likely to continue in rough times because it’s not as if it is a separate project with a higher price tag. For any students who may be reading this post: one of the areas with great future opportunities is sustainability marketing. There are lots of architects, designers, and scientists with great understanding of sustainability and environmental management; there are even a significant number of green MBAs, but there are very few people who understand both sustainability and true marketing. Many marketing professionals are interested in sustainability, but very few have been trained in both fields. That seems to be a big gap in the marketplace right now. You're absolutely right, there are very few people who can navigate the finer points of sustainability while still being able to stay effective marketers. I wonder what interesting collaborations we could see in the future from these two fields.